This statement made by a trapper in Greenville, Maine, further shows the complete lack of respect trappers have for wildlife. This is why we're working hard on a nationwide ban on trapping in all public and federally owned lands. No animal deserves to suffer for days with no access to food or water while completely exposed to the elements. Help us ban this cruel practice like so many other nations in the world. Sportsmen's groups and lawmakers work together in Augusta to promote a program that doesn't work. CAMDEN - On Nov. 7, a trapper phoned the Maine Department of Inland Fisheries and Wildlife to report a rare lynx that he'd unintentionally caught in a coyote trap in central Aroostook County. IFW biologists Jen Vashon and Rich Hope sedated the animal and found two small lacerations and mild swelling on its right front foot. The 31-pound male lynx, a federally protected threatened species, was treated with antibiotics and fluids before being released. Since September, 10 lynx have been caught in foothold traps designed to hold coyotes until they can be killed. From 1985 to 2012, 38 coyote bills were introduced in the Maine Legislature, including L.D. 902, An Act Relating To Coyote Control. The 1985 law authorized IFW to pay trappers to kill coyotes with wire neck snares. 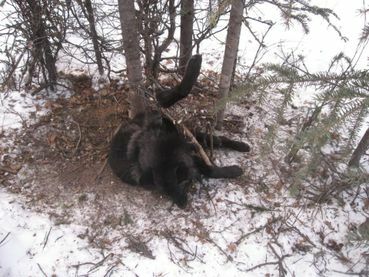 For 17 years, the coyote-snaring program cost the agency an average of $40,000 a year, according to former state Rep. Linda McKee, D-Wayne. McKee co-sponsored an unsuccessful bill to terminate coyote snaring in 2003. McKee states, "The snaring program cost the state $680,000. That money would have been far better spent purchasing deer yard habitat." From 1988 to 1990, I supervised IFW's coyote control program in the Moosehead Lake region. After seeing bobcats, foxes and deer killed in snares set for coyotes, it became clear to me that predator control programs are ineffectual and barbaric. That message was reinforced when a skilled coyote trapper entered my Greenville office to report that a state-protected endangered bald eagle had died in one of his snares. Incredulous at the fuss over one dead eagle, the trapper opined, "I've killed 22 coyotes this winter and only one eagle. That's an acceptable ratio." Since 1985, professional state wildlife biologists have asked: Why spend precious state dollars on an ineffective coyote control program that risks killing or maiming other wildlife? The answer lies in the cozy relationship between Augusta's lawmakers and lobbyists who frequently display their contempt for state biologists. The Sportsman's Alliance of Maine and the Maine Trappers Association represent hunters, fishermen and trappers. For several decades, both special- interest groups cultivated favored status with powerful legislators and politically appointed IFW commissioners. Their pro-coyote control agenda trumps science. In 1999, IFW's coyote assessment report warned of the futility of an expensive coyote control program: "Large numbers of coyotes can be taken annually from an area without realizing a long-term reduction in their population size (Coyotes can withstand annual reductions of 70 percent). A long-term reduction of coyote numbers is probably not attainable." Retired biologist Henry Hilton oversaw IFW's coyote control program for 20 years. He states, "The deer herd cannot be increased by killing coyotes. Females double their litter size to compensate for deaths of neighboring coyotes. Despite a 25-year effort to reduce coyotes through snaring and trapping, Maine's coyote population of 13,000 has remained unchanged since 1985." These facts are inconvenient truths to Augusta's revolving-door politicians and lobbyists. David Trahan, SAM's executive director, is a former Republican state senator from Waldoboro. As a legislator, Trahan was a member of the Joint Standing Committee on Inland Fisheries and Wildlife that advocated L.D. 372, An Act To Reduce Deer Predation. The 2012 law is a deceptively worded $200,000 coyote control program. Trahan now lobbies his former committee colleagues to support predator programs. State Rep. Paul Davis, R-Sangerville, chaired the 125th Legislature's Joint Standing Committee on Inland Fisheries and Wildlife. He is also a SAM board member and its treasurer. Skip Trask, an MTA staffer from 1996 to 2012, lobbied legislators on behalf of coyote trappers. Before joining MTA, Trask worked as IFW's deputy commissioner. In a January 2003 MTA newsletter, Trask disparaged IFW biologist Wally Jacubas for answering a reporter's questions about the state's coyote snaring program. Coyotes strangled by wire snares, Jacubas explained, suffer slow, agonizing deaths. Trask was furious that Jacubas, a public employee, shared necropsy data with the public. SAM and MTA represent 1 percent of the state's 1.3 million residents, yet their lobbying disproportionately dictates state wildlife policy for the other 99 percent. On Jan. 1, L.D. 372, signed by Gov. LePage last May, authorizes an additional $100,000 to kill coyotes in 2013. (L.D 372 authorized $100,000 for coyote control in 2012.) The money comes from the General Fund. LePage recently cut $35 million from state agency budgets. Maine's costly, unwinnable war on coyotes continues. Ron Joseph of Camden is a deer hunter and a retired Maine wildlife biologist. I believe that the protection of animals, is an honest feeling humanist .It means protecting nature, and the protection of Mother Earth. Noted , Thanks Roxy . Noted and signed - my prayers are with you and the wolves Roxy - let's not give up the fight - its things like this that makes me more determined to go on. Thanks :) ... the wolves are getting a terrible bum wrap in this fight, and they are losing. Its really a hard thing watching them lose this fight, mine lost ...to see the world lose these incredible animals is a loss for humanity and our children. This trapping is just terrible! I can't understand humans! They care about nothing except for their own pleasure! They do not feel other's pain! Love and Prayers Miss Roxy Love and appreciate all your hard work and what you Contribute :-) All of These Babiess are All Sacred :-) ))))))))) Thank-You , Barbara E.OOOOOOOOWWW!!!!! Rox, the original beaver trappers in the West killed off almost all beaver, and these were the guys who became the wolfers - wolf poisoners in the early-mid 1800s. Most of the self-aggrandizing "mountain men" meets are the usual Teddy R. looking fat guys with glasses and loads of guns, who have no sense of anything else living, except to be a target. Very similar "hunters' hang off jeeps with guns illegally loaded on and in their vehicles. Seen a thousand of em in the West. Who you're up against make lots of $ and pile out on weekends with hi-tech gear in any hunting seasons. I see you have an open group for wolf advocates to join named after Ostara, Roxy. Ostara's Blessings is the group name. I did not post anything, as I have only radical rhetoric and would not right now add anything of value. I hope that those activists WILL join that group and discuss what can be discussed about changing the culture to accept wolves, and helping to reintroduce them wherever the land will support packs. And of course a good place to introduce letters and petitions involving the various states in which wolves are being viciously persecuted and killed. Ostara . Rest sweet pup. Dammit Boss, this picture. I thought we got it removed. All traps should be banned, and ALL hunters should be shot! These Trappers are devoid of all feeling and compassion for animals. They enjoy knowing the wretched pain in which these defenseless animals die in. They obviously take pride in their barberic craft. The only way is to have all Traps banned everywhere. If you're going to kill an animal,just shoot it,please.